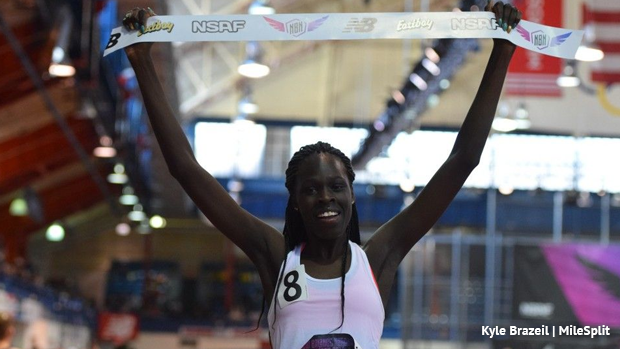 In one of the most eagerly awaited showdowns of the season between a pair of New Jersey sophomore stars, Athing Mu of the Trenton Track Club ran a US#1 and personal best 2:06.59 to capture the girls 800-meter title on Sunday at the New Balance National Indoor Championships. Sophomore Victoria Vanriele of Governor Livingston High School finished third with an indoor PR of 2:08.31. Nikki Merrill of Portsmouth in Rhode Island was second with a PR of 2:07.27. Mu also won the Emerging Elite 400 on Friday at the New Balance Nationals in a meet record 54.98, which is NJ #1 and US #15 this season. Mu's 2:06.59 is a state sophomore record and No. 3 in N.J. state indoor history, and Vanriele's 2:08.31 is No. 5 all-time on the N.J. indoor list. The N.J. state indoor record of 2:04.12 was set by Ajee' Wilson of Neptune at the 2012 Millrose Games. Joetta Clark of Columbia is No. 2 all-time with the 2:06.00 she ran in 1980. It was the first match-up of the season between Mu, who doesn't compete for her high school (Trenton), and Vanriele, who has won the last three N.J. Meet of Champions titles in the 800 (two indoors/one outdoors). The last time the two met was last June when Mu was second (2:07.70) behind national 800 indoor record holder Sammy Watson (2:05.70), and Vanriele was fourth in 2:08.23 in the 800 at the New Balance Nationals Outdoor Championships.